Math is vital to science, so let’s make it as fun as possible! -Separate your pattern blocks by pattern and count them. Then distribute them equally into Ziploc bags–one per table. It’s important that everyone has the same amount of each type of block. -Draw a bar graph on a big sheet of paper, where the options are pizza toppings or something equally fun/ridiculous. -Use masking tape to make squares on the floor with numbers inside of them. The boxes and numbers represent points for the Toss & Multiply bean bag toss. You will also want to mark a line on the floor that they have to stand behind to toss the bean bags. If you are expecting a large group, you will want to make two sets of these on opposite sides of the room. -Draw a 10×10 grid on either a white board or on a large sheet of paper that you can tape up. -Print out (or create new) handouts. First, we explained the basics of multiplication to the group, using the 10×10 grid we drew on the whiteboard. We asked if there was a fast way to count all of the squares in the grid without going 1, 2, 3, 4, etc, or without saying 10+10+10+10+10+10+10+10+10+10. A couple knew about multiplication, but most did not. So, we said that all we have to know about this grid is that there are 10 boxes horizontally and 10 boxes vertically, and that when we multiply 10×10, it equals 100–and it’s the same as adding 10+10+10+10+10+10+10+10+10+10. We acknowledged that there is a way to solve multiplication that they will learn in school when they’re a little older, but we just wanted to show them another way to think about it. We then used the grid on the board to draw a box that was 5 squares long and 2 squares wide and asked how many squares would be inside. We acknowledged that it’s smaller, so it’s easier to count the number of boxes–10. But that it could be solved by saying 5+5 = 10, or 5×2 = 10–it’s the same thing. We tried one more with a box 4 squares long and 3 squares wide. If you have a large group, separate the participants into two teams. Each person takes turns standing behind a designated line and throwing their two bean bags onto the numbered masking tape squares. (We let each person have as many tries as it took for them to land both bags at least half in a square.) Then, on one of the Graph Paper Printables, have that person fill up space on the graph with their two numbers. For instance, if they landed on a 7 and a 3, they could make a box that is 7 across and 3 down, filling up 21 squares on the grid. As we went along, we practiced multiplication by asking what 7×3 would be, or 7+7+7. We also kept track by writing this information on the board. The original intent was to count up all the boxes and declare one of the teams a “winner,” but we went way over time, so we just let it go. Still, if you cut out other activities to give this one ample time, it would be fun to make it a math competition! The inspiration for the Toss & Multiply Game came from a combination of this awesome Shoot & Add game on No Time for Flash Cards, as well as the How Long, How Many game on Unschooling Conversations. We began by explaining that you can use drawings to represent numbers with things called graphs. Graphs make it easy for us to quickly understand things like which items check out from the library the least and most–DVDs, CDs, books, etc. It can be easier to look at pictures than a bunch of numbers. We also explained that there are three types of graphs that are commonly used: pie (good for percentages, like 60% of people in our community use the library, 40% don’t), line (good for showing the number of library users each year–it might go up and down over time), and bar (good for showing how popular or unpopular things are). The project is pretty self-explanatory (picture of the graph at the top of this post). We simply made a giant bar graph with some pizza topping options on it. We verbally went through the pizza topping options twice, and asked the kids if they had their very favorite pizza topping from the list in mind. We told them that they could only choose one and they could not change their vote, because that’s the way bar graphs work. When we had a final vote for each topping, we drew a line for the number of votes and colored it in. The inspiration for this game came from an ingenious activity called “Flower Power: Problem Solving, Multiplying Decimals, and Graphing” on Teachers Pay Teachers. Because we were working with younger kids, we adapted this idea to only assign point values to the block colors, so that they could add and/or multiply whole numbers while practicing their bar graph skills. We did not give them the sheets in advance, so they did not know at the outset that each color of block had a point value. Their only instruction was to take the baggie of pattern blocks at their table and make a design of any type–but they had to share the blocks nicely with their tablemates. They could not share blocks with other tables. Once they were done, we gave them the graph sheet with the points values and instructed them to count how many of each color they had and fill it in accordingly on the graph. If they wanted to, they could figure out how many points they had for each column, as well as overall, and compare their points values with each other. The 1st graders were much less interested in figuring out points than they were designing patterns and filling in the bar graphs, so this project was well leveled across 1st-3rd graders. Because we spent so much time on Toss & Multiply and Building Points, we did not have time to do a “Magic Math” demo. We were going to use this particular example from Learn-With-Math-Games.com, as well as this 1089 trick from Math is Fun. We say this is activity is optional because we did not have time to include this during the program–instead, we gave them as bonus take-home activities. One child said, “I don’t want to do homework!” So, perhaps this activity is not worth your time to create unless you really think that you will need an extra activity to pad the program time. When this program was actually run, we did not have time to do a Magic Math demonstration, and we did not need the Codebreakers sheets to occupy any time at the end. We had these things on hand just in case our math activities were boring and went by too quickly, but they were not needed. The Toss & Multiply game took a good, long while and the kids were enjoying themselves. The Building Points game with pattern blocks sufficiently absorbed their attention until it was time to go home (because kids love to make designs with pattern blocks!). Less is always more! 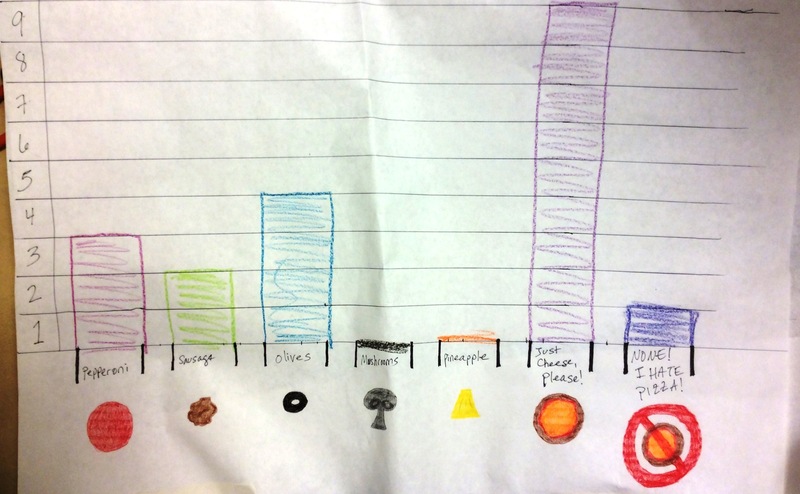 It’s also worth mentioning that it was very difficult for our youngest participants to grasp the concept of being able to vote for only one pizza topping for the Pizza Topping Bar Graph. Even though we reiterated the topping choices multiple times before beginning, as well as the fact that they had to choose their favorite right then and they could only vote on one, they still wanted to change their minds after voting. This led to one very upset child. So, perhaps a better way of doing this would be to have them all write down their votes and tabulate them in real time, even though that would be more boring. For a younger audience, we like the idea of measuring experiments (both measuring with rulers and using measuring cups/spoons to explore volume), all of which are linked above. We also love this easy Lego Challenge found on Buggy and Buddy, which helps younger kids understand mathematical concepts like patterns. This post on Mamas Like Me also uses Legos to talk about height estimation. For older kids, math can be kept creative and fun with things like: Geometry Castles, Parabolic Art, Mobius Strips, Fibonacci Art, Hexaflexagons, or String Art. « Week Sixteen: STEAM Storytime: Our Bodies!